Everton's Sam Allardyce won the battle of ex-England managers at Goodison Park to ease growing pressure with a 3-1 victory over Roy Hodgson's struggling Crystal Palace. Gylfi Sigurdsson, restored to the starting line-up along with Wayne Rooney after the shambolic 5-1 drubbing at Arsenal, and Oumar Niasse scored early in the second half with Tom Davies adding the third before Luka Milivojevic's consolation penalty. Just a second win in 10 matches opened up a nine-point gap to the bottom three while extending Palace's remarkable run of not having won without the injured Wilfried Zaha since September 2016. This was the first Premier League meeting of two ex-England managers since Kevin Keegan's Manchester City won 1-0 at home against Sir Bobby Robson's Newcastle in May 2004. The pair have recent history with Hodgson upset about being referred to as "Woy" during Allardyce's meeting with undercover reporters posing as businessmen which eventually cost the Toffees boss his job as national team manager - but the pair did shake hands in the technical area. 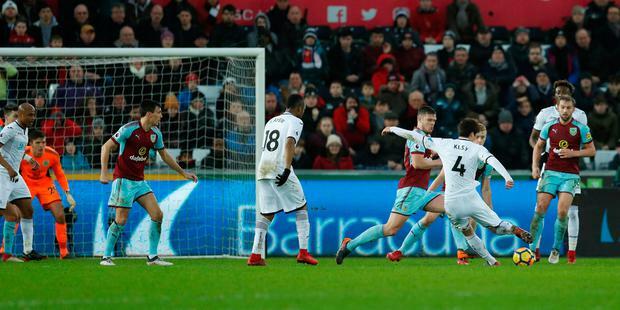 Elsewhere, Swansea picked up their third win in four games after a late strike from Ki Sung-Yong sunk Burnley at the Liberty Stadium. Carlos Carvalhal has transformed the Swans' fortunes since taking over from Paul Clement, and the Welsh side are now two points outside the relegation zone. Another team who moved away from the relegation zone today was West Ham, who advanced to 12th after their 2-0 home win over Watford. Chicharito put the Hammers in front in the first half, before Marko Arnautovic sealed the win 12 minutes from time. In the other 3pm kick-off, Stoke were held 1-1 at home to Brighton. Jose Izquierdo put the visitors ahead after 32 minutes, before Xherdan Shaqiri equalised midway through the second half. The game finished in dramatic circumstances, with Charlie Adam missing a late minute penalty that would have won the game for Stoke.